It’s been a long time since I was in Seaside, and this buzzing resort town has managed to upgrade many of its buildings without losing its old town charm and attraction for families and couples alike. My hotel clerk recommended McKeowns Restaurant & Bar, and, boy, was he spot on! Located on corner of Broadway and Holladay Drive, this family-run restaurant is spacious, with nice wooden floors and a big bright and open Caribbean themed dining room, with bright red umbrellas. Eight-foot tall palms separating the bar and restaurant and its corner windows are great for people watching. Its ambiance is very warm and welcoming. McKeown’s has delicious breakfasts with fresh baked blueberry scones, roasted potatoes with grilled onions and the best Eggs Benedict around! They offer a memorable Sunday Buffet as well. The menu runs the full gambit, covering Burgers & Sandwiches, Soups & Salads, Pasta & Chicken dishes, and of course, fresh Seafood and Choice Steaks. Try the Cedar Plank Salmon, Tempura battered Pacific Snapper, Crispy Prawns or rich House Cioppino. The Dry aged prime Beef New York Steak and Bacon wrapped Filet are incredible and the burger selections with handcut fries are just gourmet enough to make them enticing. For an Irish experience, try their house roasted Corned Beef Sandwich or the McKeown’s Irish Cottage Pie, with an ice cold Smithwicks draft beer. McKeown's serves local beers from the Fort George brewery in Astoria, making their BBQ sauce with the Cavatica Stout. The large sweet onion rings are fried in crispy beer batter made with 1811 lager. The selection of local and import beers are aimed at beer connoisseurs, and there is a great selection of Pacific Northwest wines, as well as a full bar. Fresh local ingredients and something for everyone at McKeown’s. McKeown’s has a happy hour between 3-6 daily, and live music every Saturday night and banquets and catering. 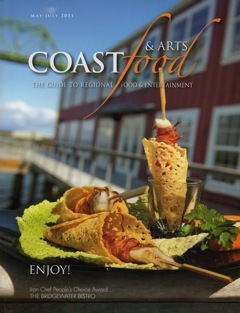 Located at 1 N. Holladay, Seaside, Oregon, 503-738-5232, www.mckeownsrestaurant.com.